There are other differences, such as A7 chip, the cameras and the dock connector, but the above would be the main things for me. The Retina display is something that I need to use on an extended basis to see how much of a difference it is, but today it just seems silly that I wouldn't get a retina model if I were to buy an iPad new. I can't comment on the retina display, but I don't have a big problem with the non-retina screen having not owned a retina display iPad. iOS is a bigger factor for me compared to iLife and iWork, as the original iPad has stopped updating after iOS5, and there are a lot of apps that I cannot use or have stopped support for iOS5 and earlier. It seems like I would be missing out on a lot of things. iLife looks the most interesting after having used it in the early 2000s on the Mac, I would like to use iLife -- or native Mac software -- as much as possible on Apple devices. I most likely will not be using iWork for work related problems, but I see myself using iWork for personal use. 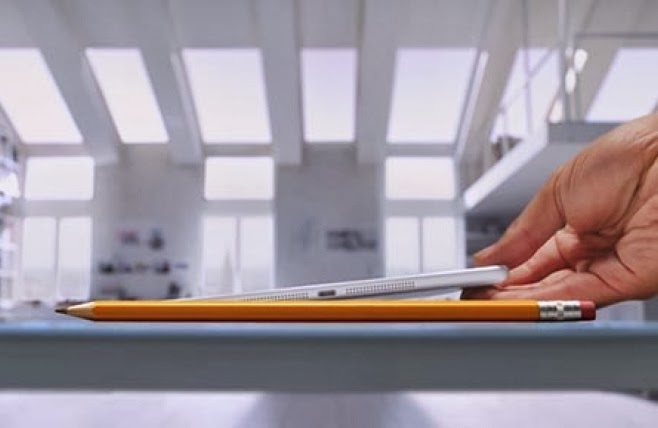 The size and weight seems to be the biggest physical change compared to the new iPad (iPad4), most notably the bezels on the side, and a near 2/3 weight change compared to the original iPad. This may be the deciding factor for me, even more than the software and hardware improvements. The iPad Air will feel so much lighter in my hands as I hold it in bed, or hold it above my face lying down. For my uses, as the iPad is used as a portable device in the house, this is a big factor. Lastly I have to consider about what to do with my original iPad if I bought the iPad Air. There are many options, such as using it in the kitchen or living room as a device for everybody/anybody, letting it be primarily used by my kids, possibly integrating it in the household interesting ways (for example, as an Apple TV remote). Of course, I can still sell the original iPad for a pretty good price, but having "the first ever iPad" may be fun on display in my house 30 years from now. There is a sense that I can still get a few more years of use from my original iPad, but for most people it may not be possible to get five years out of a device. In the age of 6 month turn arounds for most electronic devices, sadly three years of good use has to be considered a long time. Below are some articles written about the iPad Air that I liked most. Key points for me were the emphasis on the iPad Air being lighter and the distance between screen edges, which makes it easier to thumb type (I may find myself thumb typing more often). The A7 chip, making it two times faster than iPad 4 (The new iPad), and M7 chip. iLife and iWork being free, the easiness of links to iCould and the Mac. But my take, since last year, has been that the full-size iPad is best seen as an alternative to a laptop, and the iPad Mini as a supplement to a laptop. But the tremendous weight reduction in the iPad Air complicates this equation. 1. Those who still need or merely want to carry a MacBook with them when they travel, but who also want to carry an iPad. 2. Those whose portable computing needs can be met by an iPad. Finally, a surprisingly relevant comparison is made as the new iPad Air outperforms the late 2010 11-inch MacBook Air. Anand Lal Shimpi - The iPad Air Review (the most detailed, for sure) Key points for me were the emphasis on the iPad Air being lighter and the distance between screen edges, which makes it easier to thumb type (I may find myself thumb typing more often). The A7 chip, making it two times faster than iPad 4 (The new iPad), and M7 chip. iLife and iWork being free, the easiness of links to iCould and the Mac. Ben Bajarin - The iPad Air –A Truly Mass Market Personal Computer I'm reminded once again by Steve Jobs. More and more, the iPad becomes more capable to my everyday needs. The iPad is not computing dumbed down; it is powerful computing simplified. And simple solutions require sophisticated technology. Unless you are a Microsoft Office power user, iWork will more than meet your needs. iLife opens the door to a creative world unparalleled on any other tablet platform. The A7 being a 64-bit processor has laid a new foundation in mobile computing and it is one will help the iPad Air stand the test of time. This generation does seem a lot more future proof than previous models, with the 64bit A7, the retina display, and the dock connector. It can be easily concluded that there will be more incremental improvements in the future, such as fingerprint sensors and perhaps making the device a little smaller and lighter. But Apple will most likely surprise me.